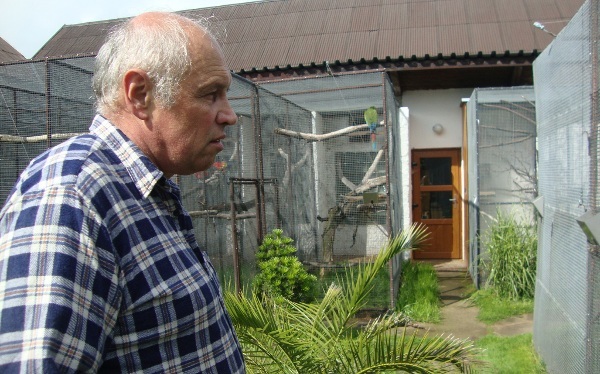 As the first breeder he bred five species of macaws in the Czech Republic. Nowadays, we can find in his facility 14 macaw species. Only two species are missing – Lear’s and Spix’s Macaws. Let us to introduce you Zdenek Spalek. Why did you choose macaws? You have had also other parrot species in the past. However, recently you breed just macaws. As a little boy in the country I liked animals very much. I start with Guinea pigs but they were killed by our cats soon. Then I had budgies, rosellas and the pearl mutation of cockatiels which was absolutely rare stuff before 1989. The price for them was 2000 CZK (=70 euro), a lot of money at that time. Then I had australian parakeets including Crimson Rosellas (my breeding pair had every season 10 youngers in two nests). 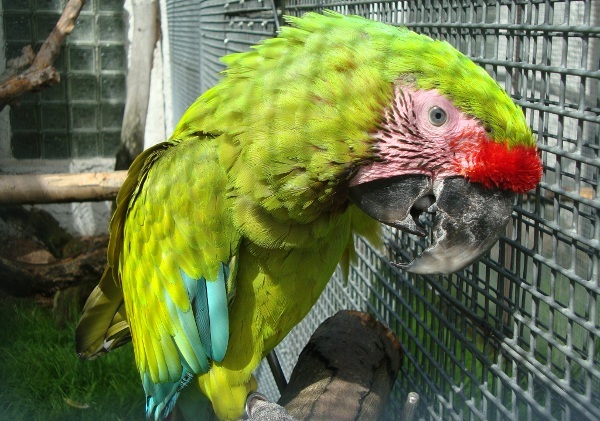 As one of the first czech breeders I bred the Red-winged Parrot, King Parrot and Patagonian Conure. I found out that my most favourite parrot species are macaws and cockatoos, eventually. When did you get your first macaw? I remember that it was pretty hard to get any macaws. Finally, I acquired my first two Blue and Gold Macaws in 1976. Soon after, I bought several cockatoo species including the Goffin’s Cockatoo, Umbrella Cockatoo, Moluccan Cockatoo and other. Together there were eight species in my collection. However, I got them from import and those parrots drove me crazy as they were too shy. My presence wasn’t a problem but when any visitors came, all parrots were hidden inside. I had Triton Cockatoos which were bought as young birds. Seven years later the male started to be very aggressive so I clipped its wing. But he made four meters long jumps then! I have never seen anything like that. I separated the female for two weeks and give it back then. However, the problem arised again. When there was a good chance to get macaws, I didn’t hesitate and sell cockatoos. That was a good decision as I got the parrots before the Czech Republic became a part of CITES convention. 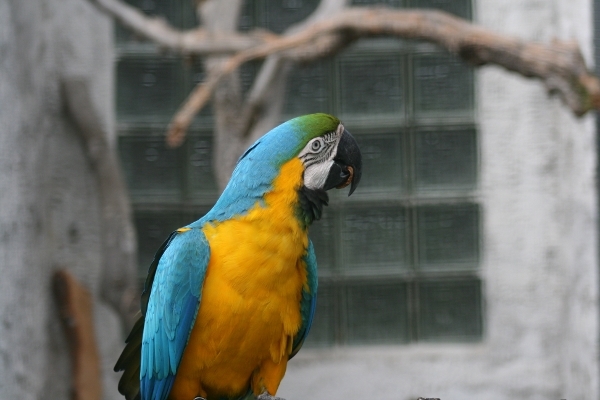 As you said, the first species was the Blue and Gold Macaw. Which macaws you have had later? You are right. 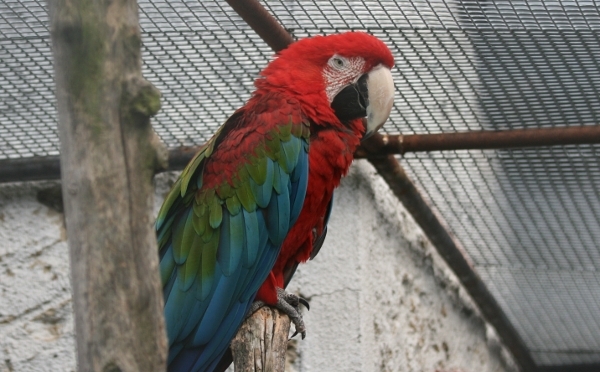 Second species was the Green-winged Macaw then the Scarlet macaw. At that time my collection has expanded quite quickly. 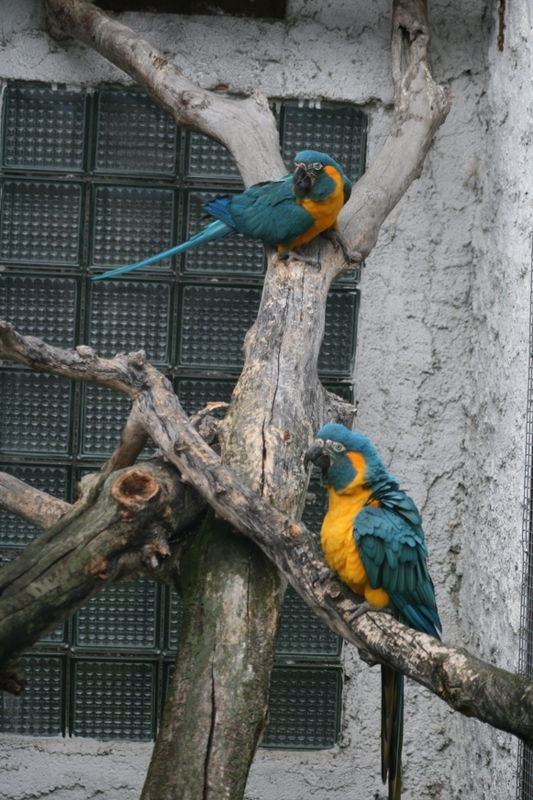 I bought the Military Macaws together with the Blue-throated Macaws. 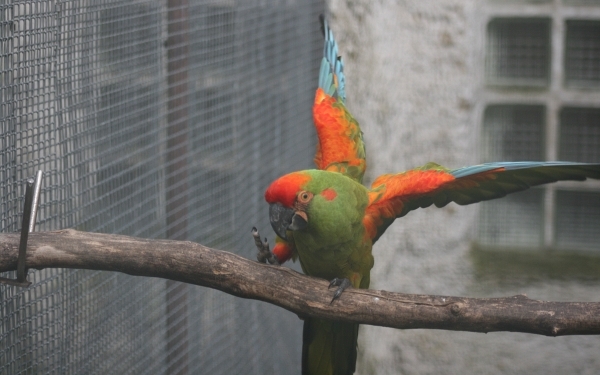 As a private breeder of macaws I have the first breeding of the Blue throated, Scarlets, Military, Red-fronted and Red-shouldered Macaws in the Czech Republic. By the time, I have been getting new species and finally Hyacinth Macaws became a part of my collection. You are breeding the most of species. Is there any macaw you haven’t bred yet? I didn’t reach successful breeding in Buffon’s Macaws. The female had eggs but the male wasn’t good I guess. Now I have a new one from Loro Parque Tenerife. They get on well together, defend their nestbox but the female stop laying. However, macaws can live a very long life, sometimes up to 80 years so a breeder has to be only patient. I had also much difficulties with Red-bellied Macaws. They have had eggs for several times and chicks hatched as well but parents killed them. But in the last year I bred one younger, eventually. In this year I have already two so I think that they will breed now. Is any species your most favourite? I don’t think so. In my point of view, there is no difference between the Red-shouldered Macaw or the Hyacinth Macaw in the quality of maintenance. All species have the same food. I have my own seed mixtures. It’s well known that you prefer parent raised birds. And you don’t like hand feeding of macaws much. Why is that? I prefer parent-raised birds because such parrots have bigger size and are in better condition. However, today there are many good hand feeding formulas. My experience says that there is huge quality difference between my parent-raised youngers and those hand feeded. According to experience of several breeders, it can be difficult to sell parent-raised birds to pet lovers. I guess that’s not your problem because most of your birds are sold to breeders. 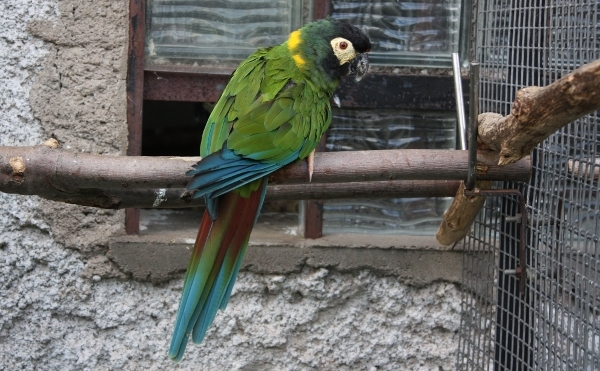 Parent raised parrots are perfect for breeding purposes. I hand feed Blue and Gold Macaws regularly for pet owners. Sometimes those people came back and buy a parent raised parrot as a partner for their tamed birds. Wild birds can be tamed but sometimes it doesn’t work. Birds have their own personality like people. Some females can incubate their eggs well but don’t feed their chicks. Other females are perfect mothers but don’t incubate. In this case I didn’t have a choice. I have tried to breed them under parents for 10 years and lost many fertile egss and chicks. I talked about that with Matthias Renschmidt from Loro Parque. In this park they give to Hyacinth Macaws nestbox 60cm high and cameras are put from the side. However, my cameras are on the top and the nestbox is 1 meter high. When the female is fed by the male she is jumping all the time and treads on chicks. When the nestbox is not so high then the female is calmer. 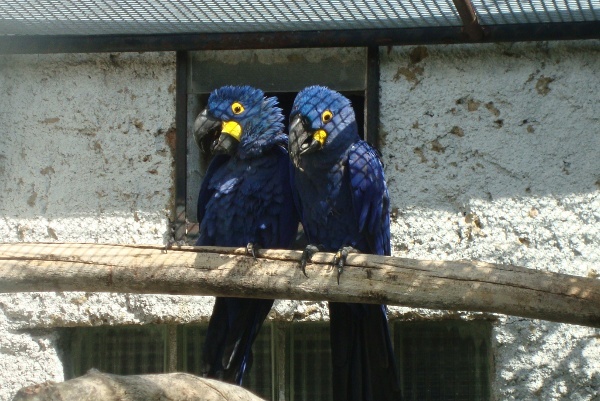 Have you ever bred Hyacinth Macaws under the parents? Not yet. I have only one breeding pair and they have still the same nestbox. I don’t want to risk the change of the nest because I don’t know how would they respond. However, new pairs will get better nestboxes. Now you have two unrelated pairs of Hyacinth Macaws. Do you want to set up more pairs? Actually we have three pairs but one pair is still young. We want at least one more pair. Are breeders interested in buying of these birds? Do youngers stay in here or are sold outside? They stay in the Czech Republic as there are not many successful breeders. You are right but I don’t make any waiting lists. When somebody calls and is interested in certain species then I make a note about that but only if the pair is already sitting on eggs or has chicks in the nestbox. For example when I have four eggs then I expect 2 youngers. Of course you can’t be sure about that until 2 young birds sit on the perch. When I ring them I always take the blood so I don’t stress them later. You said that you would like to have Lear’s Macaws. Is there any chance to get them or rather your dream? So there is a little chance? 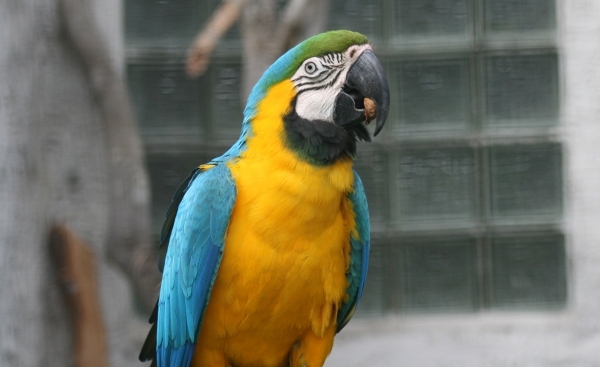 All Lear’s Macaws are the property of brazilian government. They decide if and where these birds will be kept. It’s interesting that the wild population of Lear’s Macaw is growing recently. 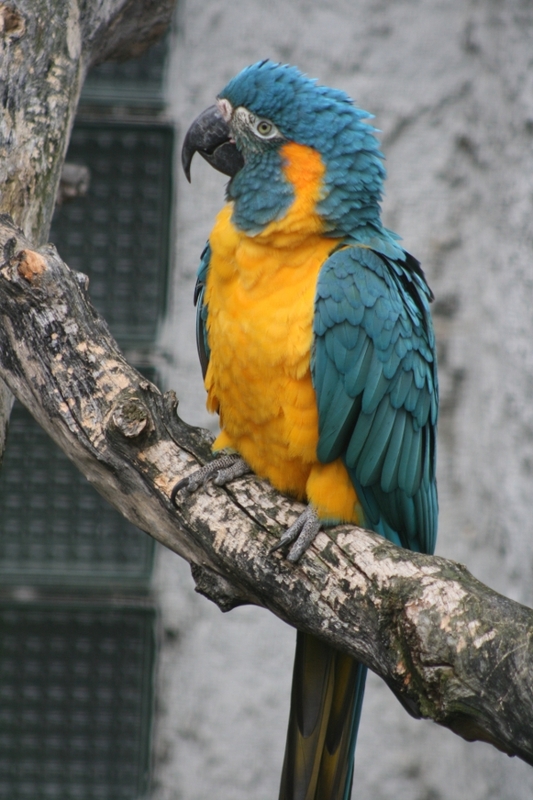 However, the Blue-throated Macaw which is quite common in captivity is currently the most threatened macaw species in the wild. You are right, they are critically endangered. I breed them well. I have breeding pairs with regular offsprings. 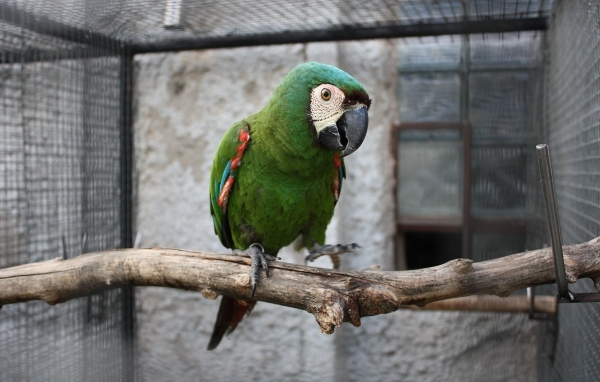 There is one more macaw species which you don’t have – the Spix Macaw. I think it’s matter of very very far future to get Spix Macaws to private breeders. Can you estimate the price for Lear’s or Spix’s Macaw? At this moment not. They were offered to me for enormous money but I didn’t take them. The origin of those birds was doubtful and I don’t want to be sent to the jail. 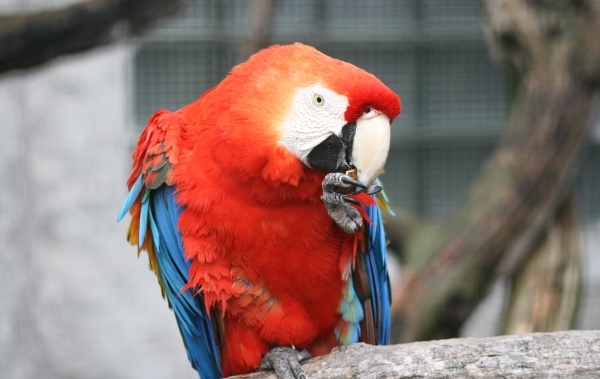 You have mentioned that the Red-bellied Macaw can be sometimes difficult to breed. 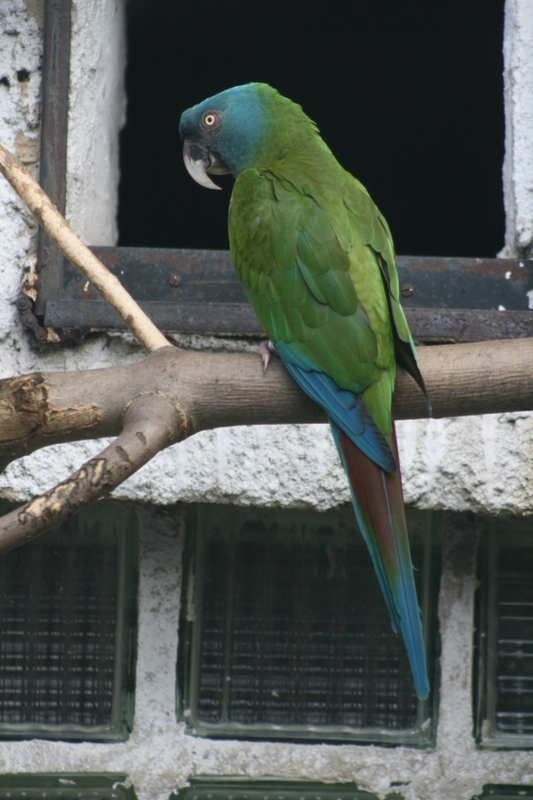 What about another small macaw – rare subspecies of the Red-shouldered Macaw – Diopsittaca nobilis cumanensis. These are very rare, indeed. I had them but they are not in my collection any more. I bred them 20 years ago and nobody wanted them. 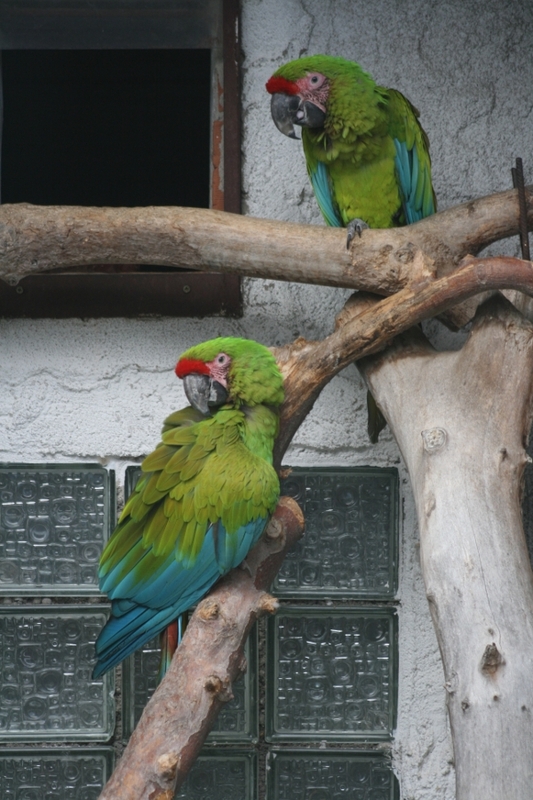 Ordinary Red-shouldered Macaws were more wanted than this subspecies so I sold them. It’s possible to get them but I don’t have a space for them now. Why is the breeding of the Red-bellied Macaw so difficult? I guess it’s about feeding and these birds are totally unpredictable. But as I already said, I can breed them as there are two youngers now in the nestbox. There were three eggs, however the last wasn’t incubated well. We have cameras only in aviaries of big macaws so we found this out too late. 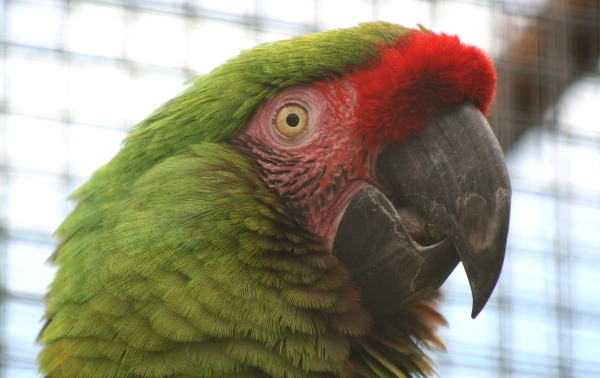 One of your biggest success is breeding of the Red-fronted Macaw. This species can be susceptible to diseases and plucking. How is that you don’t deal with these problems? I don’t know. Maybe it’s because of the way of feeding. I don’t overfeed my birds. 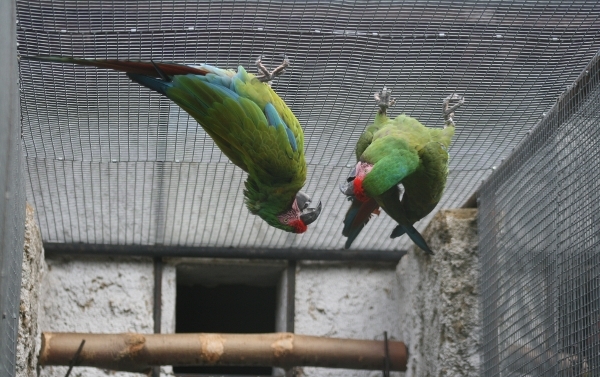 We have 8 Red-fronted Macaws in total and nor single one is plucking itself. I have talked with another macaw breeder who wants to buy them but is afraid of PDD. This species is sensitive to this disease. 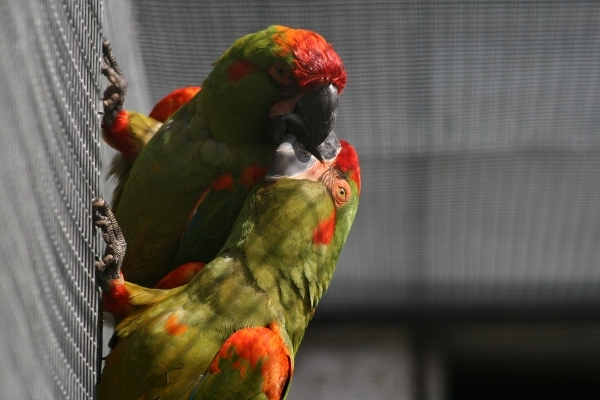 This disease is a threat for Red-fronted Macaws as well as for other macaw species. But these macaws are very sensitive to any changes in their environment and that’s the problem. According to well know avian vet Dr Tukac, Red-fronted Macaws don’t fight against this disease at all so mostly they die. You don’t feed any of your macaws with exotic fruits. They get just what you grow in the garden. Don’t they miss palm fruits and oils? I don’t think so because they breed well. My birds are in perfect condition. The only issue is with Hyacinth chicks which hatch with a straight beak under parents while in the incubator babies have a curved beak. The same is about the color of periopthalmic ring which is yellow in parent raised chicks while white when you hand feed them. Nobody knows the cause. I have noticed that you always cut the wallnut before you give it to birds. I cut them because they don’t come from our farm. Within the last year the harvest was poor so we had to buy from another source. I check them to be sure that they are not mouldy. In small species I cut it simply because they wouldn’t crack it. Do you have any idea how prices of individual species will progress in future? It’s difficult to say. I think that Hyacinth Macaws will keep their price as they are still quite difficult to breed. The same we can say about Red-fronted Macaws. There are many pairs in the Czech Republic but who breeds them? 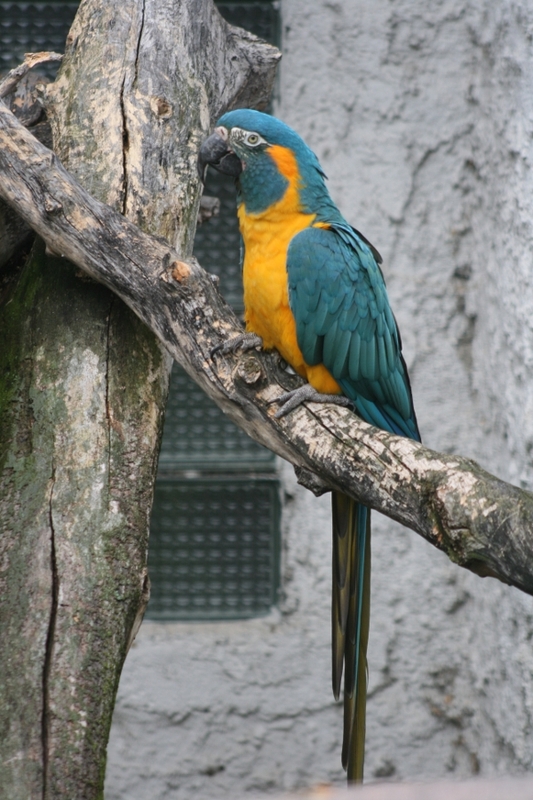 In case of the Blue-throated Macaw I think that this species will be abundant soon as they breed well. Do you plan to buy more pairs from individual species? No as I don’t have any place for them. 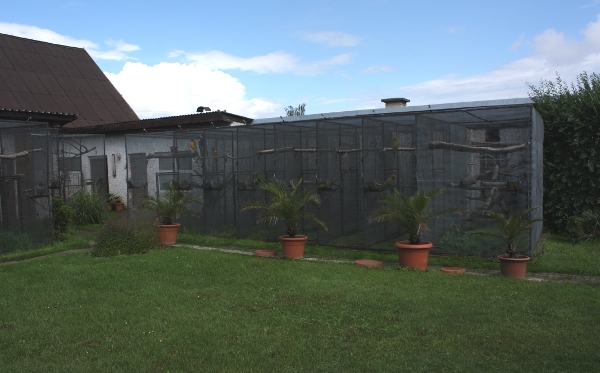 I have nine new aviaries but those are occupied already. I don’t think we will build any extra facility. Maybe when I get retired. You wouldn’t have enough time too feed new birds? I guess I would. But it’s still my hobby and I don’t want to be a slave of it. We have many more animals as well. So you won’t change your macaws for other parrot species in future? No, macaws are number one. Maybe I would like to try to breed the Thick-billed Parrot. Those birds are quite similar to macaws. But they are very rare. Do you think you could get them? My friends have them so I think it wouldn’t be a big problem. It seems very high and long.